Sterling Insurance Group is proud to announce it’s a finalist in Safeco Insurance’s Change Agent awards for 2018. The agency is 1 of 10 finalists in the competition, and 1 of only 2 agencies in the Midwest region. The theme of the award is Fighting Hunger. As a finalist, Sterling is now competing in a social media contest for a $2,000 donation to its non-profit of choice, Gleaners Community Food Bank. The social media competition runs from Monday, Aug. 20th at 2PM EST, to Friday, Aug. 24th at 4PM EST. To win, Sterling Insurance Group’s photo posted in Safeco’s Facebook album must receive the most likes, reactions and comments. Please help Sterling win this for Gleaners Community Food Bank, by commenting, liking and reacting to the photo. Find the album with Sterling’s photo here. Please note: likes, reactions and comments need to be on the photo in the album on the Safeco Facebook page, not a shared post. Shares do not count toward the total vote count. However, Sterling Insurance Group would welcome anyone sharing the photo for extra visibility. Sterling Insurance Group’s philanthropy committee – the Sterling Cares Committee – rounded up employees to volunteer last month at Gleaners Community Food Bank, something the agency does multiple times a year. Sterling Insurance Group employees rolled up their sleeves and ended up having the best time volunteering! 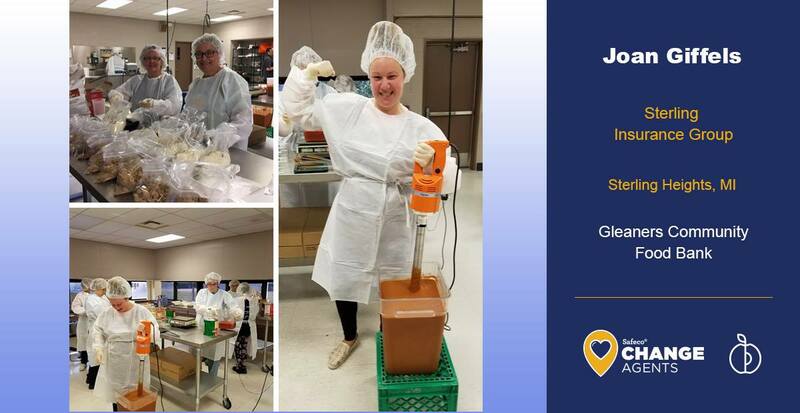 Working with Gleaners, Sterling’s representatives assisted in putting truckloads of donated vegetable puree to good use by turning it into a delicious veggie sauce. 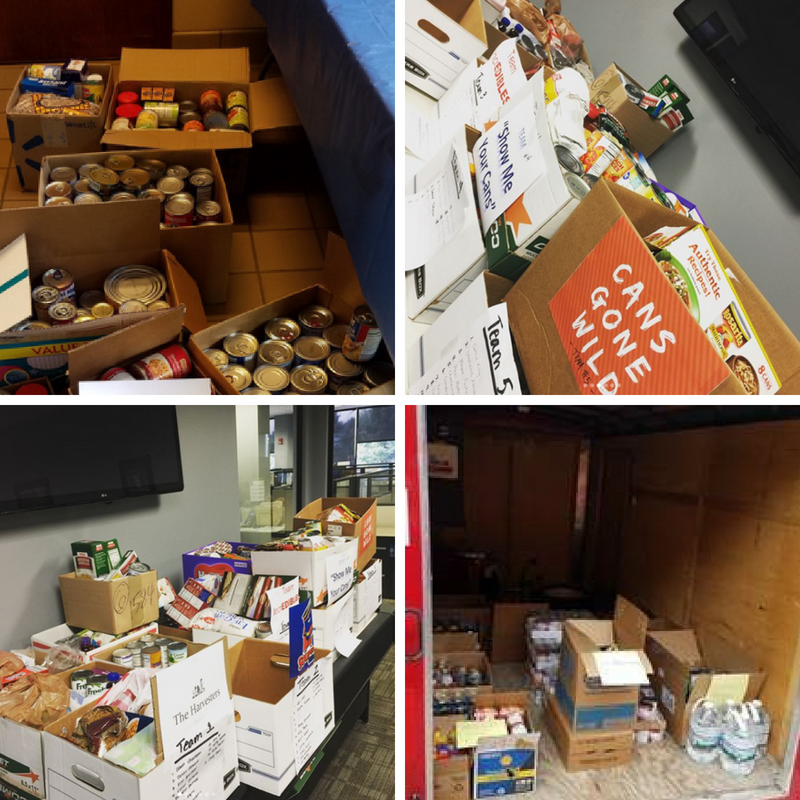 Additionally, Sterling’s Summer Food Drive brought in hundreds of pounds of goods for Gleaners to distribute to those across Southeast Michigan in need of sufficient and nutritious food and related resources. Combined with Sterling’s sister office – Lappan Agency – the two agencies brought in thousands of pounds of food! Before the Food Drive and volunteer day, Sterling Insurance Group teamed up with Insurance carriers across the board and donated over $7,000 to Upper Peninsula neighbors to assist with recovery efforts after devastating floods hit the area. Read more about this contribution on the Sterling Insurance Group blog. This spring, Sterling Insurance Group sent multiple boxes of food, books, magazines, games and other items to an employee’s son’s platoon, stationed in Afghanistan. Currently, Sterling employees are hosting their Annual School Supplies Drive. Want to help gather school supplies to donate to schools and families in-need before the school year starts? Please join our efforts and bring in supplies to our Sterling Heights office! Looking ahead, Sterling plans to assist underprivileged children around Christmas time, as well as donate to the Juvenile Diabetes Research Foundation (JDRF). Please help Sterling Insurance Group win this award for Gleaners Community Food Bank. Find the link to the Safeco album by clicking here, and commenting and liking Sterling’s photo (last in the album). Gleaners deserves this award!